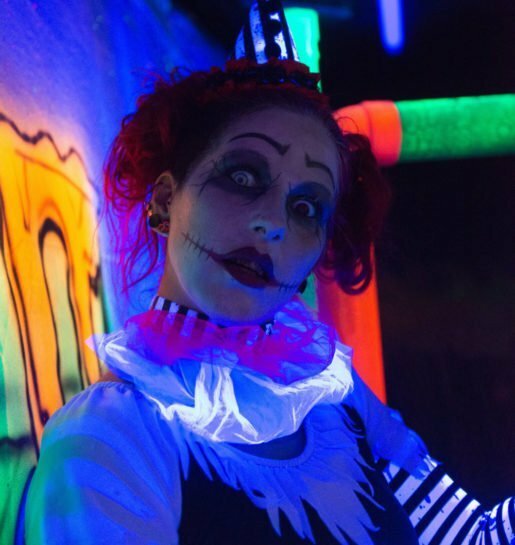 If your idea of a haunted attraction involves spattered blood, gross-out eyeballs and decaying plastic flesh, the proprietors of the Northeast’s most popular Halloween spots have news for you. Blood is out, creepy is in — and the scariest stuff, in a world jaded by R movies and Internet memes, is psychological. “It’s a lot more creative to scare people without showing them lots of blood,” said John Tracy, who co-owns Haunted Acres, a sprawling but blood-free attraction set deep in the Candia, N.H., woods. New this year at Haunted Acres was a nighttime zipline. Shown is an actor made up for the show. In lieu of blood, these haunted attractions rely on classic horror tropes to send chills down guests’ spines. Spooky, nocturnal hayrides or tractor rides, dark, web-filled barns and mazes through pitch-black cornfields are all popular. Darkness provides the ideal foil for unexpected shrieks and moans, or an actor’s clammy finger. And a lonely rural setting, where the fall wind shrieks through bare-limbed trees, sets the Halloween tone. “We like to bend people’s minds a little bit,” said James Lurgio, the owner of Count Orlok’s Nightmare Gallery in the already-spooky town of Salem, Mass. “People are afraid of the dark, so that’s going to be scary.” Add in some supernatural elements, a well-timed startle and circa-2016 animation, Lurgio said, and you have the recipe for a good, old-fashioned, bloodless fright. 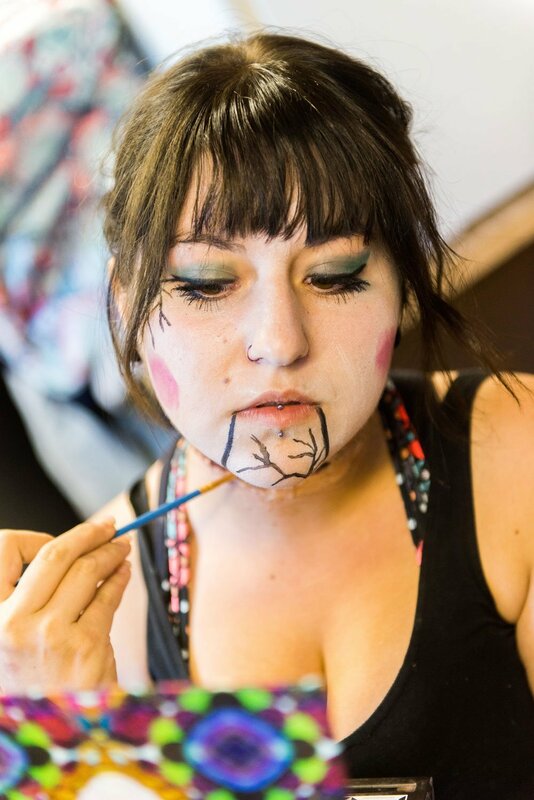 Jennifer Condron’s recipe at Bane Haunted House has three parts. One, “don’t spend a lot of money on props,” which aren’t scary anyway. Two, “make sure it’s dark. If you can see the scare in front of you, it’s not scary.” And three, “be organic. Use real items that you’d find in an abandoned house. Those are the things that actually scare people,” Condron said. Bane is known for separating people inside the haunts, “so it’s just you and your worst nightmares,” she added. This year, as part of a 5,000-square-foot expansion, Bane Haunted House features an all-black, pitch-dark hallway where guests walk alone, deprived of all senses, as rustling noises and heavy breathing unsettle the guests. “It’s so basic and simple, but it freaks you out,” said Condron, adding that only a handful of people enter the hall at any time, an intimacy that heightens fear. 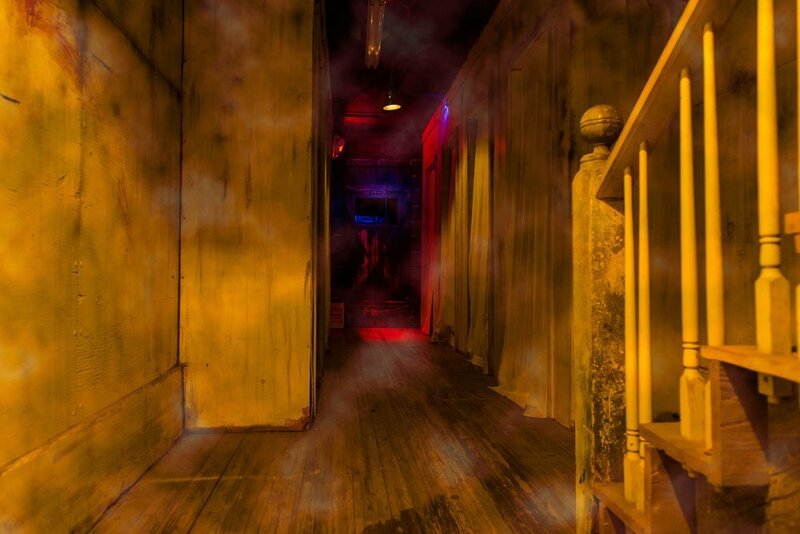 At Haunted Acres in Candia, the adrenaline gets a spike from a quarter-mile “nightmare walk” past moaning, hidden creatures; a 2,500-square-foot, pitch-black “maze from hell,” and mock nuclear facilities where flesh-eating “monsters” corner guests in claustrophobic chambers. Tracy hires 70 actors to play spooky characters around the 30-acre attraction, so you never know who’s hiding in the corn maze, rattling in the darkness, reflected behind you in a mirror — or jumping out and screaming unexpectedly. New this year at Haunted Acres: a nighttime zipline, which heightens the adrenaline rush of ziplining by adding the element of darkness. “You can’t see where you’re going, you’ve got the wind on your face, it’s exciting. And it’s something new to do at night,” said Tracy, who added that the zipline is so popular it regularly sells out. A hallway at Haunted Acres. “People like to be more entertained than grossed out, and it’s more family-oriented,” the co-owner said. As industry veterans know, high quality, low-gore scares don’t come cheap. “It’s a tough business, very expensive, and you have to constantly up your game,” said Allison Ketchem, a manager at Spooky Ranch in Columbia Station, Ohio. The horse farm, which hosts an Old West pumpkin-and-hayride attraction by day, upped its nighttime game this year with a new, 3-D “Monstervision” haunted house, where guests don special glasses and wander through a series of disorienting rooms. One features a sea of mirrors; another is filled with huge fluorescent spiders, a third room is upside down, and another lands guests in the vortex of a giant, spinning tunnel. “It’s great because it stays away from that extreme gore, so anyone can go in it together,” explained Ketchem. 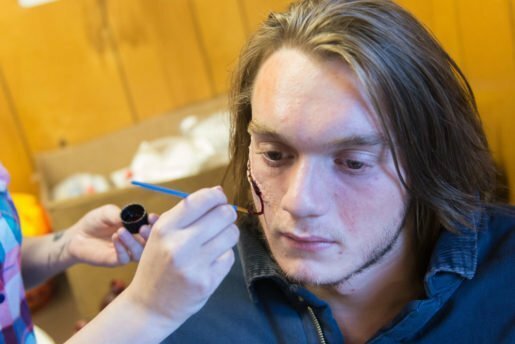 An actor applies makeup at Haunted Acres in Candia, N.H. “It’s a lot more creative to scare people without showing them lots of blood,” the co-owner said. That rural setting is also crucial to the spookiness of Harvest of Haunts, a nighttime attraction at Charmingfare Farm in Candia, N.H. “It’s part of the tradition of fall in New England, part of the culture to want to be scared,” observed spokesperson Linda Ellis, who said Charmingfare’s emphasis is on fright and folklore rather than blood and gore. A decade ago, the 31-year-old farm consciously made a shift toward entertainment for the whole family, with costumed characters to startle the eight-and-older set. But the classics are thrilling regardless of age. At Harvest of Haunts, Ellis said a popular new attraction is the haunted barn, where the vast, strategically lit space is filled with giant bales, rusted farm tools and spooky things that rustle and shriek at visitors. Outside, nobody ever gets too old for the excitement of jumping on a horse-drawn hayride…or the terror of riding a tractor through a swampy bog and ending up in a dark maze.